More than 30 million people are expected to vote in West Java’s gubernatorial election Wednesday in a contest between two former generals, the sitting deputy governor and the provincial capital’s popular mayor. They’re part of Indonesia’s 152 million voters who will elect dozens of heads of provinces, cities and districts across the archipelago. While 171 elections will be held simultaneously, whoever wins in West Java will gain significant momentum going into the 2019 presidential race. Widodo, also known as Jokowi, had been lauded for an ambitious infrastructure agenda and reform program that’s helped secure sovereign rating upgrades and much-needed investment. Yet his zeal for reform, already under a cloud after a series of populist measures in recent months, could be dialled back further if West Java was to fall into rival hands. While Jokowi’s popularity has soared across the country, West Java was the scene of one of his heaviest defeats during the 2014 election to now opposition leader Prabowo Subianto. Recent polls show the Democrat Party, led by former president Susilo Bambang Yudhoyono, who has put his son forward as a potential running mate for Jokowi, also making inroads. Home to Indonesia’s biggest electorate, the province also has the country’s highest jobless rate, at 8.16 percent – well above the national average of 5.13 percent. That could complicate Jokowi’s efforts to point to his economic record as he bids for a second term. Prabowo, whose Gerindra Party won a bitter election in Jakarta last year, remains a popular figure in West Java and is expected to challenge Jokowi for the presidency in 2019. He’s represented in West Java by Sudrajat, the former Indonesian ambassador to China, and who like Prabowo, is a retired general. In Bandung, about 140 km from Jakarta, the roadsides are clogged with large banners that include pictures of the candidates along with their respective party heads. 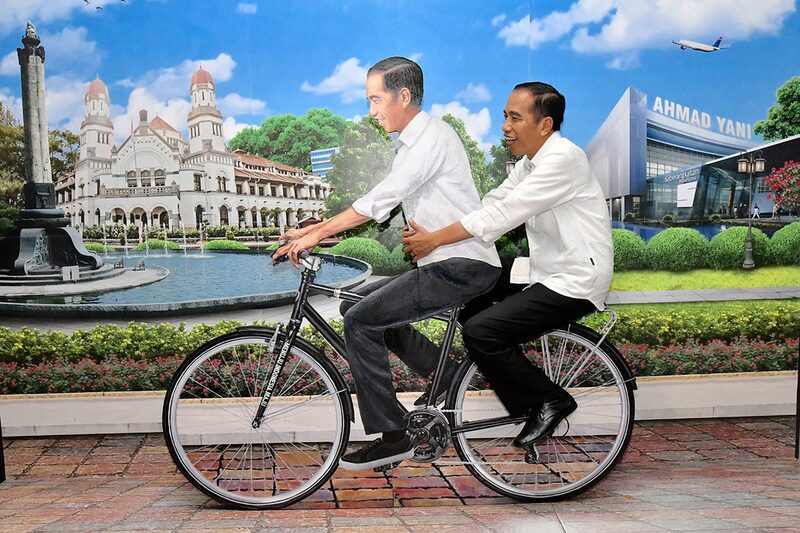 Conspicuously, there are few that feature Jokowi. Still, the president is well represented. His party, the Indonesian Democratic Party of Struggle, or PDIP, has put forward a former general in Tubagus Hasanuddin while Ridwan Kamil, the popular mayor of Bandung, who describes himself as independent, counts himself as a Jokowi man. For Agus Harimurti Yudhoyono, it’s the high-stakes contest that could catapult him into the presidential race and reinvigorate his family’s political dynasty. Yudhoyono isn’t on the ballot. But the former president’s son sees the West Java poll as a crucial opportunity to inject himself and the Democrat Party into presidential election calculations. The province’s deputy governor Deddy Mizwar, the Democrat Party candidate, has been a front-runner in a string of polls taken over recent months leading up to Wednesday’s vote. “I’m hoping the result of this regional election will be a key factor for us to determine our path including whether it will be with Pak Jokowi or other candidates,” Yudhoyono said in an interview in Bandung. His bid to become Jakarta governor in 2016 was a bruising experience. That election – marked by sectarian tensions and mass street protests – saw victory go to Anies Baswedan and Sandiaga Uno, who were backed by Prabowo. The incumbent Basuki Tjahaja Purnama, known as Ahok, an ally of Jokowi’s, was later jailed. Nominations for the presidential race have to be finalized by August ahead of voting scheduled for April 2019.